Could PNCH trading be halted ??? Well, read on and form your own opinion. We were alerted to an action by the SEC regarding a company trading under the ticker IMTC. See the SEC notification here. Right off you may initially ask yourself… what does IMTC have to do with PNCH ? Answer… nothing whatsoever. However… what’s important is the REASON the SEC halted IMTC. Now… if IMTC was halted because of “questions” surrounding “publicly disseminated information concerning” among other things “revenue and assets”… how does this differ from the questions surrounding publicly disseminated information about the revenue and assets of PNCH ? Its significant to understand that it appears no hard evidence was used in their decision, but simply the “questions” surrounding such information. There certainly have been significant questions raised about the revenue and assets of PNCH. The bashers over on LieHub have been saying and predicting the halting of PNCH for quite some time now, however it appears perhaps now the SEC is taking a serious look at companies who, although they may be compliant, or seemingly compliant on their SEC filings, such filings, and any detail, and/or lack thereof, are getting a closer look. For instance… does it seem reasonable that PNCH has had ZERO revenue in the last several quarterly reports? Where is the revenue for the advertising viewers see on the IC Places website? Where is the revenue from content being provided to Clearvision? Where is the revenue from the Prescription Discount Card program… etc., etc., etc. ??? It just defies logic and common sense that NO revenue is being generated for anything PNCH is doing. Is this enough of a “question” for the SEC to take a close look at PNCH, or, perhaps halt the trading until these type questions can be answered? There are no shortage of unanswered questions surrounding the PNCH operations and finances. The sad part of this issues is… these are self-inflicted issues. Mr. Samblis’s new concept of going dark so to speak regarding the ongoing operations of the company and discussing and documenting the flow of investor funds, is causing more red flags than the possible unflattering truth. One should ask themselves… why the secrecy surrounding cash flow. If investors navigate to the negative upon the lack of information… what will the SEC think about the lack of information. It is just normal human behavior to question the lack of factual information and secrecy to gravitate to the negative and suspect there is something to hide if there is an appearance of something being hidden from view. Of course Mr. Samblis could put the SEC and the investors at ease if he would simply inform the investing public of the whereabouts of the invested funds, as well as any revenue being generated from ongoing activities. If there really is NO revenue being generated… then that should be communicated and explained also. Mr. Samblis will likely counter with… “everything is in the filings”. Well, you have read the filings… are you satisfied ? Many are not, and the folks at the SEC are human just like you. Mr. Samblis… come forward, voluntarily, and discuss the PNCH finances. Not only will you ease investors fears… you just may head off an SEC investigation into a decision to halt trading until such information is uncovered and released. Think it can’t happen to PNCH ??? We bet that’s what the folks at IMTC were thinking also. Yes folks… looks like yet another company name change is in the works. Only this time the name appears to be going back to the previously used IC Places, Inc., and it appears to have the word Network attached to it this time around, as well as sporting a new color scheme (red). Will there be another ticker symbol change ? Will it go back to ICPA ? The name change has been confirmed by Mr. Samblis himself on the IC Places Facebook page as can be seen by the graphic below (click to enlarge). The 22 hours ago references 2/13/2014. Now… one might ask… what prompted this name change (at this time) back to the previously used IC Places? Let’s see, possibly related to any pre-trial arbitration meetings maybe? As everyone knows, after the Punch breakup Mr. Samblis insisted he owned the Punch name (and related assets)… but that was before he said they were poison and suing to get them back was a waste of time and money because Mr. Collins was “judgement proof” because he was broke. But… all that was before he most recently tried to float the idea that he was actively suing Mr. Collins again to get the assets back (which of course included the Punch name). WOW… talk about flip-flop ! So… the latest version of the story is… the company’s name will change back to essentially what it was before the Collins/Samblis merger. So what happened to all the flamboyant statements and innuendos about getting the Punch assets back? Does this mean Mr. Collins won ??? Kinda looks that way. The short story looks to be… they merged, they broke up, Mr. Samblis said he owned the Punch assets and name after the breakup… and now Mr. Samblis is changing the name of the company back to what it was before the merger. Check back tomorrow folks… maybe there will be another version yet to come. AND… continuing the questions on revenue. To date, there has been no explanation on the accounting of any revenue generated from any of these new endeavors that have come to light lately. There will be those who do not question anything Mr. Samblis does, i.e. follow blindly anything and everything he does… however then there are the more rational and logical investors that dare to question just what the company is doing with their invested dollars. As we questioned in our post here, where is the revenue being recorded. It is inconceivable that within ALL of Mr. Samblis’s efforts, Clearvision, IC Places website, etc. not $1.00 of revenue has been generated over the last several reporting periods. Look at the last few SEC filings related to revenue… not $1.00 has been recorded as flowing into the coffers of PNCH. How can that be ??? And remember… we are not talking about “profit”… we are talking “revenue”. If you buy a widget for resale and pay $10.00 for it… and you sell that widget for $8.00… you have a negative “profit” of $2.00… BUT… you have revenue of $8.00. So even if Mr. Samblis is not making a profit on running advertising, and/or not making a profit on the Clearvision deal… where is the REVENUE from those actions ??? Could it be that the revenue is being accounted for in another one of his non-public companies… and only the expenses are being run through the public company??? Either Mr. Samblis is the worst business man alive in not being able to generate even $1.00 in revenue for the vast amounts of investment dollars the company has squandered, or, the revenue is being recorded somewhere else. Of course there is always the possibility that revenue is being generated but is not being recorded anywhere… but that would be even more reckless than diverting revenue for personal gain. The IRS and the SEC does not have a sense of humor when it comes to defrauding the public by failing to report earned revenue. One has to question…why the secrecy surrounding revenue ??? Remember… EVERYTHING means something ! Well… there appears to be some progress…maybe. Mr. Steven Samblis, CEO of IC Punch Media announced today (via twitter feed from his @Orlandolive twitter feed) that ImagineTV is launching. The website is here. If you don’t like to read, there is a link here where Mr. Samblis is being interviewed about the launch and content (appears to be a “promotional” video). Without any further explanation, which is par for the course for Mr. Samblis, one is left to assume, speculate and/or conclude that this appears to be an extension, or rebirth, of his Self Help Center endeavor. If you navigate to the Self Help Center website, you are now simply re-directed to the IC Places website. One thing that jumped out at us upon initial review, was the “relationship” of the new initiative. In the graphic below (click to enlarge), notice the highlighted section. This notation leaves open the question as to what extent this initiative will benefit the shareholders of PNCH. In our post here about where’s the revenue, one must question where any revenue and/or profit will be accounted for as a result of any sales THIS initiative has. Also notice the reference in the graphic below. 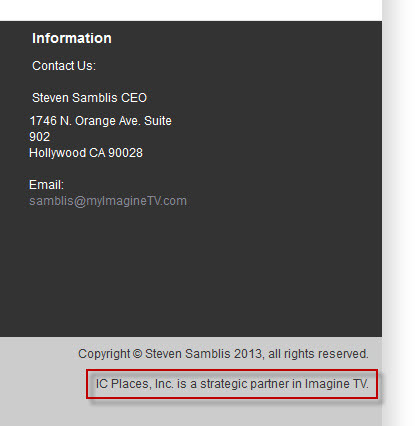 IC Places has “invested” in Imagine TV. What does that mean ??? If invested in the traditional terms, does that mean Mr. Samblis, through IC Places Inc. has bought shares in the Imagine TV company? If so, how much investment, and where did the funds come from for the investment – Mr. Samblis’s “personal” funds, or PNCH funds? AND… like VU Television, there appears to be confusion surrounding multiple Imagine TV companies all using the same or slight variation of the Imagine name (sort of like MYimaginetv). So if there was really an investment, i.e. an exchange of funds, which company was the investment placed in? As usual, with no explanation, and the past history of questionable creditability of Mr. Samblis… this new initiative creates more questions than it provides answers. What, on the surface, appears to be a good thing, may in fact be not so much. We guess, stay tuned, hopefully there will be a press release explaining the relationship. However, as press releases go, they usually create more questions then they answer, and, even if Mr. Samblis were to personally provide an explanation to the investors of PNCH, it will likely be code-speak as suggested in this excerpt from our post here. Mr. Samblis… please provide a meaningful explanation of the relationship arrangement posted on the MyImagineTV website, along with what, if any, benefit this new initiative will have for the investors of PNCH. And please… no code-speak !